When you travel around New Zealand you will soon notice that several places try to increase tourism through town branding. Plenty of towns try to make themselves sound appealing even if they don’t necessarily are/look appealing. 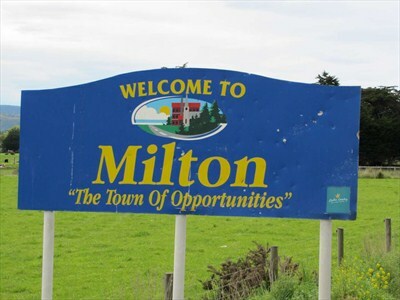 Havelock’s and Winton’s slogans are somewhat reasonable, but I couldn’t get my head around how Milton praised itself with being the town of opportunities – just a little narcissistic!? I dearly love New Zealand and nothing against its townships but I’m just saying, such slogans might increase visitors’ expectations and eventually leave them disappointed. But I guess at least it gives them the opportunity to roll their eyes, have a chuckle, and shake their heads in amusement/disbelief. This entry was posted on 20/03/2014 by G in Miscellaneous, Places and tagged New Zealand, road, sign, slogan, town.